For services to be available for booking online they must be enabled for online booking. 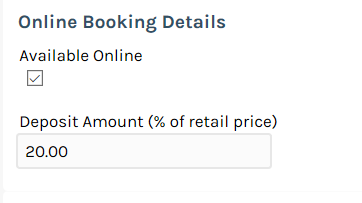 You can optionally also set up any deposit amount you want to be paid for booking a service. It is also a good idea to keep in mind that you don't need to require all your services be available online, if some are going to be too confusing or better booked in store then you can untick the option. 2. 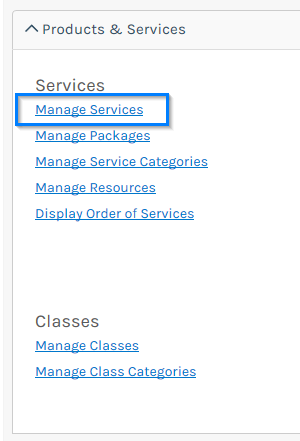 Under the Products & Services section click Manage Your Services. 3. Click on the service in the list of services that you wish to change. 4. Make sure the details of the service are correct, including the name, description and price. 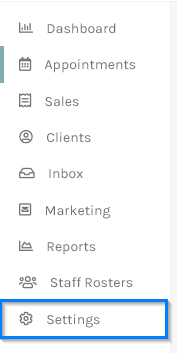 These details will be visible to the client when booking. 5. In the Online Booking section make sure the Available Online ticked if you want it bookable or unticked if you don't. You can also set the deposit as a percentage or fixed amount depending on how you have configured deposits. 6. Click Save to update all the details.